Architectural LED products are attractive lighting system, which offers inventive pliability to lighting designer, which they could only wish for. Architectural LED products have very wide application range; they are used for illuminating monuments, museums, bridges and residence with artistic integration of light source. Architectural LED products are stunning lighting systems and at the same time, they are cost effective too. In terms of energy saving, architectural LED products are way better than traditional lighting system. Apart from that, architectural LED products are available in market in different shapes and sizes and can be installed easily in indoor and outdoor places. Global architectural LED market is projected to expand at a robust compound annual growth (CAGR) rate of 18.2% over the forecast period 2017-2024. In past few years, the demand for architectural LED from almost all sectors including residential and commercial sector have seen remarkable rise. The global market of architectural LED products stood at a valuation of about USD 3.9 billion, by the end of 2016 and it is anticipated to rise in near future. By the end of forecast period, architectural LED market is expected to reach at a valuation of about USD 10 million and is projected to maintain the same positive rise in demand for architectural LED products over the forecast period. Geographically, global market of architectural LED products is segmented into five regions; these include Europe, Asia Pacific, North America, Latin America and Middle East & Africa. 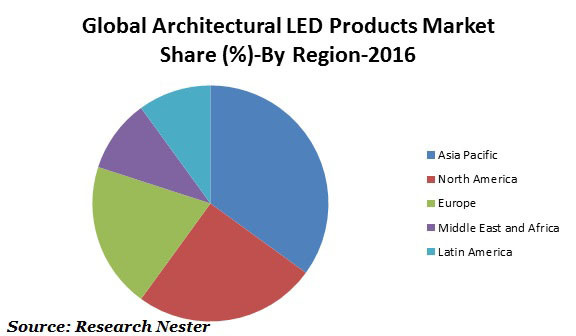 Among these regions, Asia Pacific region is dominating the global architectural LED market with a share about 48% by the end of 2016. With rise in adoption of architectural LED products in Asia Pacific region, it is analyzed to remain dominant over the forecast period. Rising demand for architectural LED products in North America and Europe region is anticipated to foster the growth of these regions over the forecast period. Attractiveness, flexible installation, significant cost reduction and consistent brightness & uniformity are some of the major drivers which have driven the global architectural LED market. The architectural LED products can be very attractive and at same time they can be proved as a cost effective lighting products too. These factors have propelled the demand for architectural LED products and global architectural LED products market is projected to witness a robust growth in near future. Apart from that, the governments of many countries such as China, USA, and Thailand etc. have been promoting architectural LED products for its features such as affordable price and low carbon emission. In addition to this, the government in countries such as China, USA, and Malaysia etc. has banned the adoption of conventional lighting system due to their high carbon emission and encouraging construction companies to deploy architectural LED products. Further, these factors are driving the growth of architectural LED products market. Moreover, the architectural LED has longer life span as compared to other conventional lighting product; these factors are expected to increase the demand for architectural LED products in near future. In addition to this, the increasing purchasing power of the consumers and their inclination toward luxurious life style is expected to propel the growth of global market of architectural LED products. However, the challenges such as high initial cost and lack of awareness among end users about architectural LED products will have to face by manufacturers of the architectural LED products. Toshiba Lighting & Technology Corp.